It will be eleven years ago this May that I picked up my first BREW foster, a frightened, dazed, lemon beagle (with maybe a little basset hound thrown in) named Toby. I remember the first time I saw him, thinking "Oh good, I won't be tempted to keep him. He isn't even cute." Famous last words! Toby had been pulled from a high-kill shelter in Ohio where he was three days past his euthanasia date, being held for pick-up by BREW. This shelter must have been a bad one, as Toby was shell-shocked, his ears filthy and his coat as rough as straw. In fact he was in such bad shape that he was advertised as a "senior." Obviously, since that was 11 years ago and he is still with us, that wasn't the case. I now think he was around 3-4 yrs old when I first saw him. Several things became clear in the first few weeks we had Toby as a foster: he had been well-loved and well-cared for, probably by a man, as he fell completely in love with my husband. He knew what a couch was for and settled right onto the furniture, so he had been an inside dog. And he routinely dug his way under our fence or bolted out of open doors, taking off for the neighbor's house, possibly explaining how he ended up lost in a shelter. He wasn't the best house-guest, either. He tried to pick fights with my very passive, sweet German shepherd; he lifted his leg everywhere in the house; and then he'd escape again. Toby was our foster for about 6 mos. before anyone even inquired about adopting him. By that time, my husband couldn't bear to let him go. So we applied to adopt him, or "foster fail." A funny thing happened right after we were approved to be Toby's forever home: he stopped marking in the house, and he stopped picking fights with our other dogs. It was as if he knew he was home again. His coat had become soft and his ears clear. He still tried to take off every now and then, but mostly he enjoyed being part of a family again. 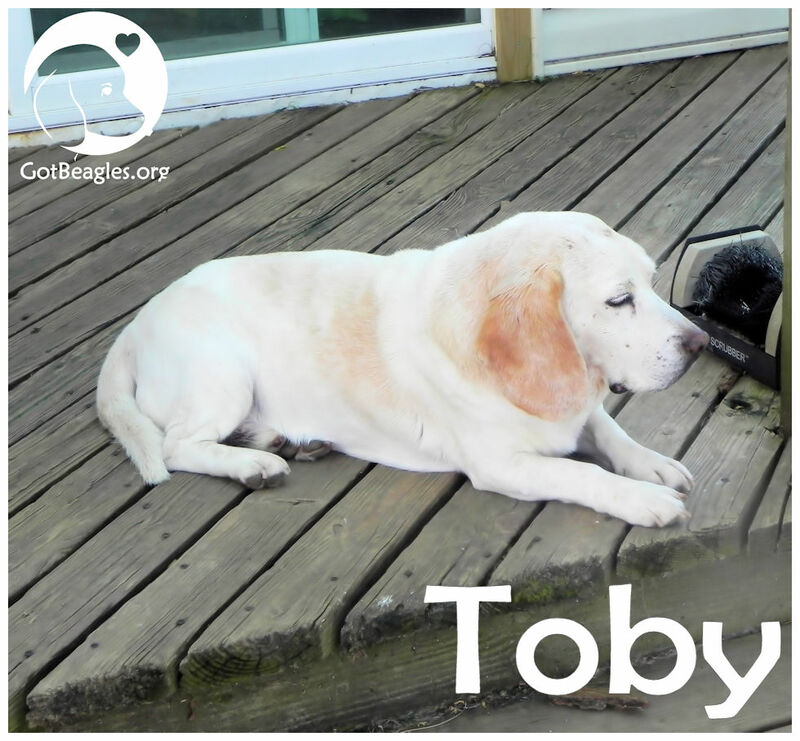 Through the years, Toby - now definitely a senior and decidedly grayer - has been spoiled with long country walks, trips to the park, and garage sale outings (one of his favorite activities). He's the only dog allowed to sleep in our bedroom at night and he does so on a special orthopedic dog bed. I think he's the most beautiful hound I've ever seen! Now mostly blind and somewhat deaf, he still enjoys his walks (shorter and slower now) and plays with toys. I tell him every night how much I love him. I'm a designated AKC Breeder of Merit of show beagles, and yet, Toby is my favorite houndie-boy. I'm so grateful to BREW for letting me have this wonderful boy. I don't know how much time we have left together, but we will enjoy every minute!